On our first day we did an 18km walk to French Valley. So named because a Frenchman came here in the mid-1800s and bought a huge tract of land from the government who was encouraging Europeans to settle here. He donated the land back later for a park. This is the mountain we walked around to get up the valley which is on the right of it. Here we are setting out - you can see that it's a bit windy. After a boat ride across the lake to the mountains behind, the straw hat was quickly replaced by a toque (wool hat) and an overcoat was put on. It was really windy, cold, and occasionally snowy. And up and down hill! On another walk we saw these tiny lady slippers, probably no more than 3" high. And lots of guanacos which are part of the camel family. 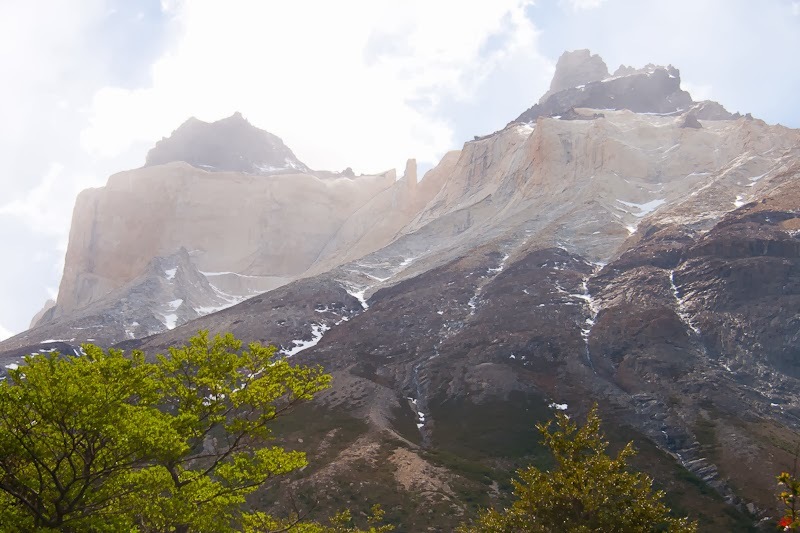 These are the towers that Torres del Paine are named for. Yet more amazing images. Did you really walk all that way?! I am curious about the different coloured layers of the earth/rock in that first picture. I guess the black is lava but what is the lighter tan coloured rock? And why the rings of colour? Very impressive, Dianne! Both the walk and the extreme landscape. Love the picture of the flower. Welcome back.